March 5, 2014 10:36 PM EST -- (TRN) -- U.S. Department of Defense satellite imagery has detected the arrival of more than thirty (30) Russian nuclear bombers to the airfield adjacent to Russia's Borisoglebsk national level nuclear weapons storage facility (Voronezh-45) and has observed numerous transfers from the storage facility to the aircraft, which are now standing-by along the two runways at the airport. [b]However, it goes without saying that “support” to the formation of a Neo-Nazi government does not in any way imply the development of “fascist tendencies” within the White House, the State Department and the US Congress. After reading this above article Burgundia I really fear for you living in the Ukraine. On the 20th of February, according to reports, more than twenty protesters were killed by professional snipers. This was not a spontaneous event resulting from clashes between protesters and riot police, nor was it marked by an exchange of gunfire between the police and the Neo-Nazi militia. The sniper killings had the hallmarks of a carefully planned operation. They happened within ‘the space of a few hours”. Moreover, the killings coincided with the meetings of President Viktor Yanukovych with a high level EU delegation. In a bitter irony, these targeted killings were used as a pretext to topple the government and issue an arrest warrant directed against President Yanukovych. The following RT report confirms what is already known. The US Sponsored Neo-Nazi opposition militia was behind the shooting of civilians on February 20th. Civilian casualties were part of this staged agenda, with a view to accusing President Yanukovych of “mass murder”, thereby providing a justification for regime change on humanitarian grounds. “There is now stronger and stronger understanding that behind the snipers, it was not Yanukovich, but it was somebody from the new coalition,” Paet said during the conversation. “I think we do want to investigate. I mean, I didn’t pick that up, that’s interesting. Gosh,” Ashton answered. The call took place after Estonia’s Foreign Minister Urmas Paet visited Kiev on February 25 at the peak of clashes between the pro-EU protesters and security forces in the Ukrainian capital. Paet also recalled his conversation with a doctor who treated those shot by snipers in Kiev. She said that both protesters and police were shot at by the same people. “And second, what was quite disturbing, this same Olga [Bogomolets] told as well that all the evidence shows that the people who were killed by snipers from both sides, among policemen and then people from the streets, that they were the same snipers killing people from both sides,” the Estonian FM stressed. “So that she then also showed me some photos she said that as a medical doctor she can say that it is the same handwriting, the same type of bullets, and it’s really disturbing that now the new coalition, that they don’t want to investigate what exactly happened,” Paet said. The file was reportedly uploaded to the web by officers of Security Service of Ukraine (SBU) loyal to ousted President Viktor Yanukovich who hacked Paet’s and Ashton’s phones. Jenetta, I am a bit more fortunate :).We'll see for how long. I live in Poland. March 07, 2014 "Information Clearing House - According to a report in Kommersant-Ukraine, the finance ministry of Washington’s stooges in Kiev who are pretending to be a government has prepared an economic austerity plan that will cut Ukrainian pensions from $160 to $80 so that Western bankers who lent money to Ukraine can be repaid at the expense of Ukraine’s poor. http://www.kommersant.ua/doc/2424454 It is Greece all over again. burgundia wrote: Jenetta, I am a bit more fortunate :).We'll see for how long. I live in Poland. This time the UE puppets and NATO have gone too far . We have here in Italy baffoons in charge who are incapable of thinking with their own brains . in charge have gone one bridge too far with their threats and subversions . A lot of people here do not support the political correct point of view expressed by the government paid newspapers . Now why am I NOT surprised that You'd say that ? Enemy , the same in Poland. People do not approve of the policy of our NWO government. They can see through the propaganda lies. It is enough to read comments on the Internet. That statement is startling by itself, but the true gravity of this situation is only evident when you consider it in context. China has taken Russia's side in the Ukraine conflict (they are after all allies) and China holds the lion's share of U.S. treasuries. If Russia puts out the call to drop the dollar China would have a choice: either hold on to those treasuries while the dollar slides (losing their shirt in the process) or join Russia and dump their holdings as well. It should be pretty obvious which way China would go. Metaw pointed this video to me. Is Ukraine’s New Prime Minister a Jew? To comment on this article go to B’Man’s Revolt. A few days ago I received an email sent out to a number of people that proclaimed excitedly that the new interim prime minister of Ukraine, Arseniy Yatsenyuk, is a Jew. The evidence presented in support of the assertion was this sentence on his Wikipedia page: “He was born to in a family of Jewish-Ukrainian professors of the Chernivtsi University.” The fact that he says that he is now a Ukrainian Greek Catholic, also noted on the Wikipedia page, was discounted by the sender of the email as simply a matter of convenience for him. Nationalist leader Oleh Tyahnybok spoke those words in a speech ten years ago. 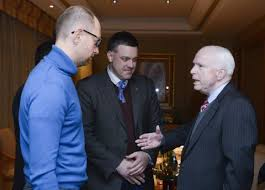 Most recently he was one of the key figures along with Yatsenyuk in the ouster of President Viktor Yanyukovich. Politics, as they say, makes strange bedfellows. Returning to the title question, more than raw emotion or political demagoguery can be behind the labeling of Yatsenyuk as a Jew. Orthodox Jews, as it turns out, agree with Mayor Ratushniak that regardless of the religion that he currently professes, Yatsenyuk is a Jew. With them, accident of birth is everything. His mother was a Jew so he’s a Jew as they see it. This bloodline-based view, of course, is very far from the Christian position. As a professed convert to Christianity, Yatsenyuk should be embraced. From Wikipedia we know that this practice of fake conversion is very old . "people pretended to be Christians when in reality they practiced judaism "
"Marranos (Spanish: [maˈranos]; Portuguese: [mɐˈʁɐnuʃ], [mɐˈʁɐnus], sing. marrano; Catalan: marrans [məˈrans], [maˈrans], sing. marrà) were originally Jews living in the Iberian Peninsula who converted or were forced to convert to Christianity, some of whom may have continued to practice Judaism in secret. The term came into later use in 1492 with the Castilian Alhambra Decree, reversing protections originally in the Treaty of Granada (1491). The converts were also known as cristianos nuevos (Spanish) or cristãos-novos (Portuguese), which mean New Christians; conversos (the converted); or anusim (Hebrew for "forced"). The latter is the preferred term among their descendants and some scholars: Marrano had and has still today a pejorative sense in Spanish. " The practice of fake conversion is alive an well . It is one of the many techniques used by the zionists to infiltrate societies and control the population . Marriages , adoptions and even buying of kids are other ways of infiltration . In a series of hacked emails received from “Anonymous Ukraine” it is clear that Pentagon officials working in concert with extremist elements in the Ukraine have carried out and are planning more attacks in Ukraine. What is also clear is that these attacks are to be blamed on Russia including blowing up planes at an airport. Other attacks may well include mass civilian casualties. I think it's time to implement the plan we discussed lately. Your job is to cause some problems to the transport hubs in the south-east in order to frame-up the neighbor. The Centre’s White Paper provides what intelligence experts call “deception and cover” for terror attacks planned, as we learn, by the US Army working with Ukrainian military officials and terrorist groups. Proceed with caution. Speak only Russian. 25 team is executing combat missions, so do not do them much damage to aircraft . There is a lot of scrap metal, with it you can do anything. Damaged aircraft you specify. It is essential that all was as real attack neighbor's Special Forces. But without corpses. Will publication of this hacked email actually stop the upcoming attack on Melitopol? When they specify that corpses aren’t needed, does this mean that they are planning on getting them elsewhere? When they say “the money will come in time,” are they aware of sequestration and how the US has been paying its bills less quickly than before? We quickly found Pasha Tarasenko through his “My Space” account. Prominently featured is a photograph in a Ukrainian Army officers dress uniform. It began with terrorist snipers hired by the “new” Ukrainian government, killing their own supporters. The US involvement was long proven through the infamous Victoria Nuland phone conversation, America “anointing” their chosen terrorists to stage a confrontation with Russia. The second call, between the Estonian Foreign Minister, Urmas Paet and EU Foreign Minister Catherine Ahston gave us that “smoking gun,” that the current cabal in Kiev are terrorists and criminals. We now have Americans hiring terrorists, planning attacks, working with the Ukrainian Army and Neo-Nazi groups to blow up planes, attack airports and clearly do so in order to blame Russia and inflame the world to the point of war. Many of the other documents show planning and logistic support through Bulgaria with PowerPoints in English. Mixed in with the documents are a selection of NATO unclassified news reports. What can be safely assumed? The US government, certainly the State Department and US Army are involved. NATO involvement is a given. The current rulers in Kiev are proven to be the criminal element predicted by Catherine Ashton of the EU and so many others. What we do have is a clear smoking gun, not just names but personal email addresses, mobile phone numbers and language that can never be mistaken. Gladio based false flag terrorism is alive and well, there can be no question. It’s quite obvious, based on Kerry’s statement, that the Obama Administration really has no idea what to do, as they are still talking through “various options,” something that probably should have been worked out well before President Obama began slinging rhetoric over the crisis. What the Obama administration assumes will happen is that they’ll force Russia into compliance by coming after their economy. Obama will hit the Late Night TV circuit to tout his success, we’ll all laugh about it, and then go on our merry way. Putin will be left embarrassed and laying in the fetal position sucking his thumb. At least that’s the plan. But two can play at that game and China, which has stood by Russia’s show of force in Europe since the get-go, has now upped the ante. It’s a brilliant move designed, once again, to show the world that President Obama and the United States are no longer running the show. The White House’s deadline for Russia to pull back is Monday. Will Obama blink again, as he did in Syria? Let’s remember that China holds trillions of dollars of US debt. All they have to do is hint (not even actually do it) that they will pull back on Treasury purchases and we’re toast within days. We shouldn’t be at all surprised if, on Monday, Vladimir Putin thumbs his nose at the west again and actually sends his troops across the Crimean border into Ukraine. One thing’s for sure. President Obama’s foreign policy has been a complete and utter disaster on every front. Either this destruction of America’s worldwide credibility is pre-planned or there is a gaggle of idiots in charge at 1600 Pennsylvania Avenue. Perhaps both. Ukraine’s Gold Reserves Secretely Flown Out and Confiscated by the New York Federal Reserve? So You don't think We're being pushed into War ??? There is an Expletive in this Post and the Video. With that said - It is necessary to get the point across and comes from the participants in the Video. My apologies beforehand. Vitali Klitschko: Leader of the Ukrainian Democratic Alliance for Reform and Member of the Ukrainian Parliament. It's interesting how many are on the same page in the 'Comments' section these days. I believe more people really are finally waking up.